Subscribe to ASSEMBLY RSS Feed! Keep up to date on the latest news and information posted to Assemblymag.com with our RSS feed. 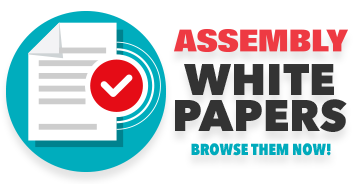 The Assembly Blog is written by our team of editors and industry experts. It provides thought-provoking opinions on issues and trends in manufacturing, as wells tips, tricks and suggestions for implementing assembly technology. Articles about assembly technologies and trends in the aerospace industry. Articles about assembly technologies and trends in the appliance industry. Articles about assembly technologies and trends in the automotive industry. Articles about assembly technologies and trends in the medical device industry. Articles about how to design products for efficient manufacture and assembly. Articles about energy-efficiency, landfill-free manufacturing and other green topics. Articles about how to eliminate waste and continuously improve your assembly operation. Articles about assembly technologies and trends in the machinery industry. Articles about assembly technologies and trends in the electronics industry. Articles about epoxies, cyanoacrylates and other adhesives. Articles about pneumatic, hydraulic and servo-electric assembly presses. Articles about high-speed, multistation automated assembly systems. Articles about the technology for dispensing and curing adhesives, solder paste and other fluids. For a product to be assembled successfully, it’s essential to move the right parts, to the right place, in the right orientation, at the right time. Motion control technology makes that happen. Articles about threaded and nonthreaded fasteners and the equipment for installing them. Articles about the various techniques for assembly plastic parts, including ultrasonic welding, snap-fits and threaded fasteners. Articles about Cartesian, SCARA and other robots, as well as peripheral equipment, such as grippers. Articles about vision systems, leak testers and other technologies for testing and inspecting parts and assemblies. Articles about the various technologies for welding, soldering and brazing metal and plastic parts. Articles about stripping, cutting, crimping, assembling and testing wire and cable. Articles about workstations and ergonomics for the assembly line. Short items explaining how manufacturers are using assembly technology to solve problems or improve processes. Detailed profiles of real-world multistation automated assembly systems. Our nationally known expert discusses issues and trends in assembly with threaded fasteners. Short reports on issues affecting medical device manufacturers. Articles about manufacturing research being conducted at the nation's top engineering schools. Our nationally known expert offers his unique take on how to improve assembly designs. Commentary on issues and events of interest to manufacturers. Articles about technologies and trends in motion control systems for assembly automation. Editor’s note: Harry Moser’s column will appear every other month. Has your company reshored production? Are you thinking about it? We’d like to hear from you. We would love to report on your successes or opportunities in future issues. Contact harry. moser@reshorenow.org. The latest on recent innovations in our industry. “We Fed It” is a regular series profiling parts feeders for automated assembly. Whether it’s a vibratory bowl, a tray feeder or a flexible robotic system, if you’ve solved a parts-feeding challenge, we’d like to hear about it. Send an e-mail to John Sprovieri, editor of ASSEMBLY, at sprovierij@bnpmedia.com, or call 630-776-0924. ASSEMBLY magazine is celebrating its 60th anniversary this year. To mark the occasion, we are conducting a series of interviews with manufacturing executives from various industries. “21st Century Assembly” will look back on the technologies and strategies that have made a big impact on manufacturing and—more importantly—look ahead to the future. Quarterly column from Jon Quigley, Jon has held engineering and management positions at Volvo Trucks, PACCAR and other companies. In-depth profiles of the winners of our annual "Assembly Plant of the Year" contest. Our annual study of what assembly technologies manufacturers are buying and how much their spending on them. Our annual look at the workplace trends and salaries of assembly professionals. Additional resources in this kit from Bosch Rexroth designed to provide in-depth engineering support. Expert knowledge and resources to implement your Factory of the Future - NOW. The latest technology and innovations from Bosch Rexroth.